I never could picture myself wearing neon green. To be honest, I'm not a fan. I've never found the selection of neon green polishes out there to be flattering, however when I spotted this Spoiled neon green I started to warm up to it. It was one of those polishes you see a handful a times, take a second glance...go "hmmmmm" and decide against it. I did this a handful of times, but finally I broke down and bought it. I'm glad I did! 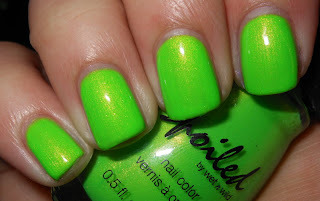 I'm So Jaded is a neon lime green with a golden shimmer. This truly pops! I don't know why, but I find this color so much better than other neon greens I've seen. I see other neon greens, and they remind me of early 90's Nickelodeon chunky slime. They're just...too green for me? That doesn't make much sense. This on the other, hand is more of a yellow-toned green, and I find it more vibrant than other neon greens. The shimmer in it adds dimension. I'm also a sucker for gold shimmer. The brush on this was wonky like my other Spoileds, but I really love this color so I'll make an exception for it. I now have a neon green I love! That's an accomplishment! I'm looking for a bright green for water marbling, I think I'll give this one a shot! I've never been super in to green polishes, but I love this! The shimmer in that is very nice! OMG that green is awesome!! OMGAH, I am headed to CVS after I get my kid today to get this bad boy. That's an awesome green! I had no idea this color was so spectacular! I just pictured typical neon green. Must. Have. Polish. I was just at CVS yesterday looking at their polishes. I saw the neons but wasn't sure about the formula. This one looks nice though. How many coats is this? Was it ok to work with? This color is fabulous! I want it. Neon greens are my favorite but I don't have any like this!!!! WOW. This shade is incredible. I'm not a fan of green nail polish in general, but wow. This is something I'd love to have in my arsenal. It looks like it applied like a dream. Woah! I have never heard of this brand before, but I LOVE that green color! Oooh, I love it! I'm so into bright colors right now. This is definitely going on my wishlist! I never would wear a shade like this before either....but something is happening this year with my comfort zone. I love this and would wear it. I was not able to find Spoiled anywhere in this rural area I live in. But last week was out of the area a ways - went into a tiny, tiny CVS looking for 1 shade of Revlon Colorstay I really want. They did not have any of those - but I saw Spoiled on a display for the first time! It looked like the display had been rapped! I picked up 2 shades. When at the counter was told they were buy 2 get 1 free - did I want to pick out another? There were only about 5 left and not this fun green. I will pay the drugstore prices for these fun colors now calling to be but not more $ because I cannot see them lasting for me in what I would probably wear when this burst of all colors out there being 'the thing' this year. I still love all my neutral clothing and give the color punch with a polish, a purse, shoes, a watch or a scarf that has been picked up CHEAP. Gorgeous! I love this neon green. It looks really nice! Great pictures! I LOVE THIS COLOR! I love it on you, and I love it in general. And now... I needs it. This is a great neon color! I was out buying nail polish today and just couldn't quite bring myself to buy a neon...they seem so...iffy. This one looks great though...maybe I've found one to try! This looks great on you! Lol @ chunky slime. That was so gross. I'm not a neon lover. Well, not on me anyway. Love it on others. Ha, Nickelodeon slime! But yeah, this green is awesome. Love everything about this! I'll be looking for it the next time I'm in CVS. Boo!!! It's all sold out at my CVS!